This Memorial Day Weekend, sailors in dress whites, Marines, and members of the Coast Guard roamed New York City to take in the sights and activities of New York's Fleet Week.We set out to meet sailors to see what they actually do during Fleet Week, a tradition in which recently deployed military ships dock in major U.S. cities like New York for one week. After walking around the city for a while, we spotted Petty Officer Second Class Spencer Roby talking to a local across the street from a Navy Band concert in Herald Square. Petty Office Second Class Spencer Roby shakes the hand of a man in front of him as he is introduced on-air during the Late Night With Seth Meyers show. "We have duty every three days and on our off-duty days we have to help sponsor an event," Roby said. "Our event last night was to attend the Late Night With Seth Meyers and represent the Navy in the audience. 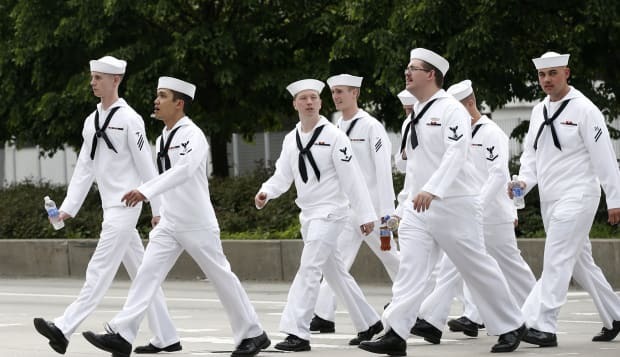 "On their off days sailors have to wear their dress whites and in doing so, they still represent the Navy when they're out in public. Many people have posted their photos with sailors on Twitter under the hashtag #SelfieWithASailor.